Last night Michy and I headed to yoga while Ian and the munchkin had some quality time. When we got home I was wicked hungry and made myself a veg-friendly, very six-year-old dinner. 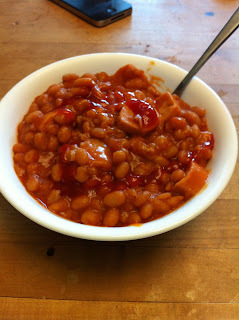 A smartdog cut up hot dog in veggie baked beans. This morning I got up before the baby to work on tutus for tomorrow's Red Dress Run with Michy and Laurel. They are so fun and simple to do. I took 3 rolls of 6in x 25 yards of red tulle and one roll of 6in x 10 yard sliver glitter tulle for each tutu along with some red ribbon. Everything was purchased from either AC Moore or Joanne's. 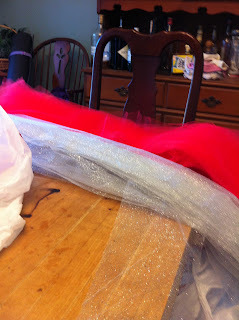 I took some elastic, sewed the ends together to form a waist band and attached the tulle with a simple Lark's Head knot. Super easy and cute. Now there is silver glitter all over my house! 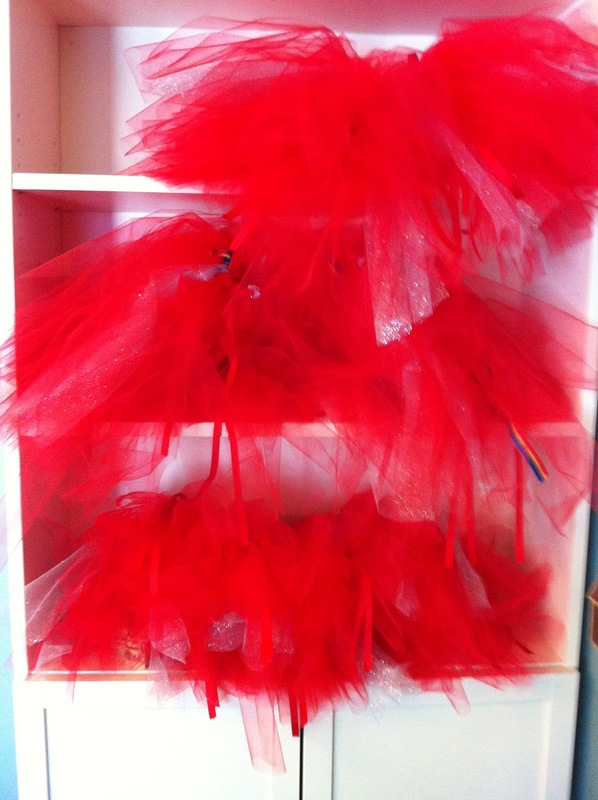 Once I was done with the tutus, it was time to get the munchkin up and fed. 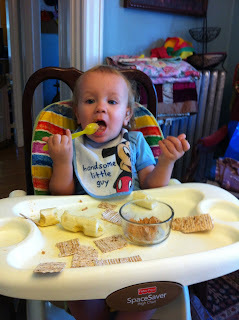 bananas, rice crackers, and peanut butter! Today will be work meetings and writing. This was such a weird week with the holiday in the middle, it feels strange that tomorrow is the weekend.